Described as “just a big kid at heart” by many of his graduate students, Professor R. James Cross, Jr. has had a driving curiosity from a very young age. This curiosity has catapulted him to become one of Yale’s most esteemed Professors of Chemistry. Since 1966, Cross has performed extensive research on the properties of atoms and small molecules trapped inside fullerenes, which are large molecules of carbon (C60) in the form of hollow spheres. Cross was first exposed to “hot atom chemistry” during his undergraduate years at Yale, and he attributes his enthusiasm for science to the excellent teaching he received there. Researching under Richard Wolfgang, Cross studied “hot” atoms with high kinetic energies produced via nuclear decay. By the time he graduated in 1962, he was a senior member of Wolfgang’s research team. Cross then attended graduate school at the University of California – Berkeley and later completed his Ph.D. at Harvard under the guidance of Nobel Prize-winning chemist Dr. Dudley Herschbach. At Harvard, he elaborated on his undergraduate “hot atom” research by studying chemical reactions under atypical conditions. In particular, he looked at molecular beams: fast-moving particles produced by allowing gases at high pressures to expand through small orifices into chambers at lower pressures. In 1966 Cross retuned to Yale and continued his research as an Assistant Professor (1966-1970) and an Associate Professor (1970-1979), becoming a Professor of Chemistry in 1979. During his first 27 years as a Yale faculty member, Cross worked on molecular beams and elastic and inelastic molecular reactive scattering theory. 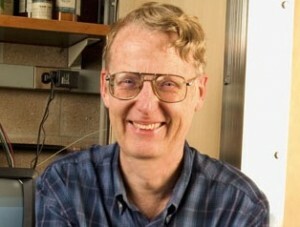 However, the year 1993 marked a novel change in Cross’s research endeavors.That year, he published his first paper on fullerenes, and over the last sixteen years, he has worked in conjunction with Professor Martin Saunders to trap small molecules in fullerenes under extreme conditions of heat and pressure (650°C and 3000 atm). The Cross lab has trapped He, Ar, Kr, Xe, 3H, and N atoms as well as He2, Ne2, CO, and N2 molecules inside various fullerenes. These molecules are truly “unusual” because although there is no chemical bond between the trapped atom and the cage of carbon molecules, the atom cannot escape unless multiple chemical bonds between carbon atoms are broken. Researchers in the Cross lab track the behavior of noble gas-fullerene compounds by mass spectroscopy and follow tritium-fullerene compounds by nuclear magnetic resonance spectroscopy. “Science at Yale has improved dramatically under the guidance of President Levin,” Cross remarks. Throughout his rich scientific experience here, Cross has worked with a variety of international fullerene research organizations, including institutions in Spain, Israel, Japan, and Switzerland. He plans to retire after this academic year, having played a major role in transforming fullerene research from relative nonexistence into a “fully mature research field.” If this were not accomplishment enough, Cross also mentioned that one of his main sources of pride was serving as the Ph.D. mentor for Dr. Francis Collins (GRD ’74), the current Director of the National Institutes of Health. An outstanding career in science may have been in the cards for Cross all along. “I used to take wristwatches apart and put them back together as a kid,” he said, “and I never lost that natural curiosity. I just tried to focus it and make it a little more sophisticated.” Indeed, this “big kid at heart” has achieved many big feats over the last 43 years here at Yale.